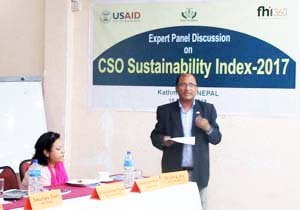 GoGo Foundation in association with the FHI 360/USAID organized a Expert Panel Meeting to prepare Civil Society Sustainability Index (CSOSI) of 2017. 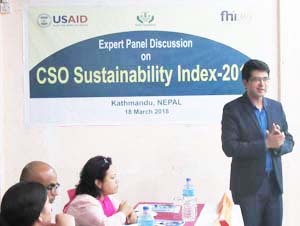 This is an unique exercise to produce score with justifications to gauze enabling environment of CSOs in Nepal. Total twenty panelists representing from CSOs, academia, media, development partner association, federations and government representatives intensively discussed and finalized the score. CSOSI is global initiatives covering more than 70 countries. Since 2014 GoGo Foundation has been coordinating this initiatives for Nepal. Asian version of report covers seven countries (Nepal, Bangladesh, Srilanka, Thailand, Philippines, Indonesia and Cambodia). The meeting held on 18 March 2018 in Kathmandu.